The world-class enterprise is client-oriented and client-driven. The starting point is "listening to the voice of the clients". The ending point is "measuring clients' satisfaction". This is an endless loop, a closed circle. Everybody in the enterprise is well educated in this regard. Everybody in the enterprise knows that the existence of the enterprise is strictly linked to Clients' satisfaction. And acts accordingly. Know the Client. Know as much as possible about Clients. Know what clients want, need, expect and wish. Know the past history, behaviour and significant facts related to all clients. World-class enterprises have a system, by which all pertinent and significant data regarding clients, including all parameters related to clients' satisfaction, are gathered, classified, rationally recorded and systematically analysed. Significant information is extracted, ad diffused at all levels in the enterprise. So that everybody knows about clients. Maximise Clients' satisfaction. By providing clients with the level of value they want and need, in a mature, adult mode (professional, new-world approach). It all starts by listening to the voice of the customer - by understanding needs and wants, clearly, intimately - by agreeing, in a mature mode, on all terms of the value associated with each transaction - by educating the customer if the situation suggests it - by helping clients in making the best decisions under the circumstances - by establishing clear paths and adult relationships. It is then a matter of generating/providing the agreed value to clients: whenever possible or viable, in excess - never in defect. To close the loop, customer's satisfaction is measured systematically : there and then, whenever possible/feasible. Manage Clients' expectations. This is much more than attending to Clients' satisfaction. 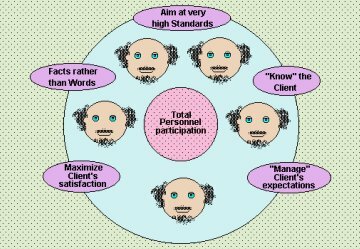 This implies knowing clients to such an extent as to fully understand their expressed, implied, and un-spoken expectations, even those un-known to clients themselves. Clients' expectations of any nature are then elaborated. Product's/service's features are amended, modified, enhanced to suit the circumstances. Items of extra-service are creatively identified and produced. Negotiated/agreed upon terms and conditions are operationally improved/bettered. Promises are not only maintained - promises are regularly exceeded. Facts rather than words. No exception. This is self-explanatory. Aim at very high standards. The best, or, at least, the best under the circumstances. World-class performance is not only an enterprise's matter, is everybody's matter. When people are not prepared to settle for anything less than the best, and their "learning" targets at best practices, the road to excellence opens up. This is particularly true with regard to relationship with clients. In fact, the client area is the launching pad to excellence. Aiming at high standards is a core parameter of a world-class vision and a key principle in a world-class industrial culture. In the world-class enterprise the overall approach to external clients and to internal clients is identical. No distinction is made between external and internal clients. Performance improvement is always addressed, as a priority, to maximise value generated by those "core" processes that relate directly to clients or "touch" somehow clients.